Hatfield Town Council is based at Birchwood Leisure Centre. Information and Key Personnel are listed below. The information in email messages should be regarded as confidential and is intended for the addressee only unless explicitly stated. If you have received a message in error it must be deleted and the sender notified. The views expressed in any message are personal and not necessarily those of Hatfield Town Council unless explicitly stated. Please be aware that emails sent to or received from Hatfield Town Council may be intercepted and read by the council. Interception will only occur to ensure compliance with council policies or procedures or regulatory obligations, to prevent or deter crime, or for the purposes of essential maintenance or support of the email system. Hatfield Town Council has a duty to ensure the security of personal data. We make sure that your information is protected from unauthorised access, loss, manipulation, falsification, destruction or unauthorised disclosure. This is done through appropriate technical measures and appropriate policies. Copies of these policies can be requested. We will only keep your data for the purpose it was collected for and only for as long as is necessary. After which it will be deleted. (You many request the deletion of your data held by Hatfield Town Council at any time). If you believe that the information we have about you is incorrect, you may contact us so that we can update it and keep your data accurate. Please contact: Carrie Lloyd – town.clerk@hatfield-herts.gov.uk to request this. 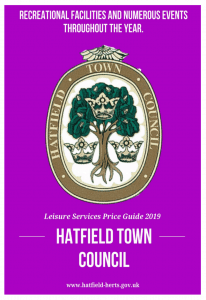 If you wish Hatfield Town Council to delete the information about you please contact: Carrie Lloyd – town.clerk@hatfield-herts.gov.uk to request this. If you believe that your data is not being processed for the purpose it has been collected for, you may object: Please contact Carrie Lloyd – town.clerk@hatfield-herts.gov.uk to object. Hatfield Town Council does not use any form of automated decision making or the profiling of individual personal data. Summary: In accordance with the law, Hatfield Town Council only collects a limited amount of information about you that is necessary for correspondence, information and service provision. Hatfield Town Council does not use profiling, we do not sell or pass your data to third parties. Your Council does not use your data for purposes other than those specified. We make sure your data is stored securely. We delete all information deemed to be no longer necessary and constantly review our Privacy Policies to keep it up to date in protecting your data. You can request a copy of our policies at any time.